The Breakaway Trailer Brake Kit is mandatory for all trailers over 2000 kg GTM. Should the tow vehicle and trailer separate accidentally, the trailer brakes are engaged at full power for a minimum of 15 minutes. The breakaway kit provides a total solution to the Australian Design Rule requirements. Important Note: Lanyards must be shortened during installation. Click this link for more information. Note; it is important to note that there is no requirement for an independent, designated or separate breakaway battery system. 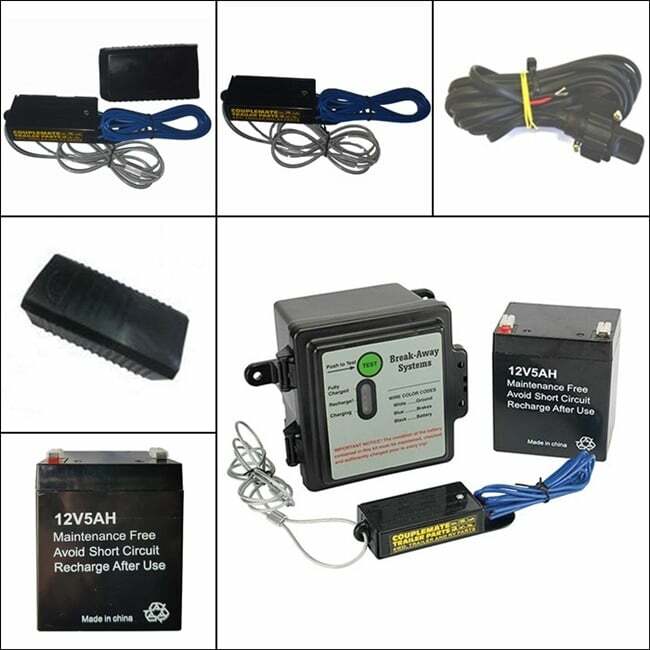 In other words, your onboard 12v battery in your caravan or camper may be used as a breakaway battery provided it can apply 12vdc to your electric brakes. Further, the onboard caravan battery will be larger than the minimum requirement and have the same or larger capacity than the smaller unit. The breakaway switch is designed to operate electric brakes for 15 minutes in cases where the trailer was detached from the vehicle when travelling. Additionally, included in the price is a rubber boot that fits over the breakaway switch. The rubber boot greatly helps prevent water ingress. Fits all Breakaway Kits except RV Electronics. Mount the Remote Breakaway Kit Monitor in clear view of the driver either in the Cab or mounted to the side of the trailer or caravan in clear view of the driver. Installing Breakaway Battery Magnetic Monitor. Connect the battery indicator cable directly to the breakaway battery, insert the 10 amp fuse in line close to the battery. If the battery indicator flashers RED, only the breakaway battery is low on amp hour. The Battery indicator does not illuminate. Recharge or replace the breakaway battery. The battery indicator will switch off when the battery is lower than 11 to 9 volts. The battery indicator draws low milliamps and will pulsate different flashing colour continually on a battery for 12 months. Testing the breakaway battery system refer to RTA Vehicle Inspector Bulletin No 06 April 1998. Requirements for large trailers equipped with Electrically Operated Brakes. Disconnect the trailer plug when testing the breakaway kit. Failure to do so may result in severe damage to Vehicles Electric brake controller. Furthermore, whenever a Trailer is presented for inspection, the towing vehicle must be equipped with a compatible charging system that is connected to the trailers breakaway battery. Finally, a label must be affixed to all electric barked trailers stating that any tow vehicle must be equipped with an acceptable charging/warning circuit. If voltage loss exists, increase the size of the cable to the brakes to 4mm or 5mm. Increasing the size of the cable removes voltage loss and restores voltage to 12vdc. Wiring Diagram for Breakaway Kit. L Electric / Hydraulic controllers use a 17 Amp Hour battery because the hydraulic motor uses more power than an electric magnet. Caravan and Trailer breakaway kits article can be found here. 5A – 12V Replacement Battery to suit Breakaway Kit. How do I tell when the battery requires replacement? Your breakaway battery will require replacement when you cannot get a green light on your control panel. As opposed to America where there is no requirement for test lights. If your battery will not take charge, then it needs replacing. While you are changing your battery, Read this handy article about the correct Lanyard Length. Breakaway switch incl waterproof rubber cover is designed to help prevent water ingress into your breakaway switch. Water and dirt enter the switching mechanism making it inoperable. As a result, the switch should be replaced. Shorten the breakaway switch lanyard for effective breaking when your caravan is on its safety chains. Finally, all trailers over 2000kg require a breakaway switch.